Waverly - Cottage Farm Inc.
2003 14.1 1/2 bay pony mare by Dutch New Forest stallion Wicked Court Jester X Zauberelle who showed thru GP with Heather Mason. She is a premium mare with ISR scoring a whopping 107 points at her mare inspection. She has not yet been bred as I love to ride her and kept thinking I would find time to campaign her. She is eligible to be inspected with most of the pony registries and would be an incredible addition to a quality pony breeding operation . Due to my varied work schedule, and other time related issues she has not had the work she should have. She is very talented,great lateral work, has low miles therefore next to no wear and tear.I have owned her since a weanling so full history in known. Never sick or lame . Lightly shown (http://www.centerlinescores.com/Horse/Details/1012609#filterBy=scores) but has plenty of miles away from the farm in clinics, trail riding and going to hang out at polo practice. 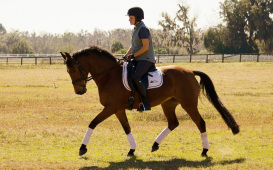 Very forward, big gaits for her size so not for a novice or nervous rider . Waverly is now in foal to the phenomenal Welsh Cob stallion, NF Brenin Cardi. Two in one opportunity for some lucky person﻿﻿﻿﻿. ﻿Call or email for details﻿.